Age 58 of Minnetonka passed away suddenly but peacefully, surrounded by family, on March 24, 2019 at the U of M Hospital Mpls due to heart failure associated with cancer. He was preceded in death by his husband and partner of 20 years, Dale R. Peterson, and his parents, John R. and Jeannine D. (Kelley) Rynerson. John, lovingly known as “Tad” to his family, was born in Hackensack, NJ on September 29, 1960, and raised in Wichita, KS and St. Charles, MO before settling in Apple Valley, MN in 1968. John met his partner and the love of his life, Dale, in 1995; both men quickly became the most beloved uncles within each other’s families. After the MN marriage law passed, in June 2014, John and Dale hosted the most beautiful and meaningful wedding and reception that many of their friends had ever attended. It felt fitting that these two were finally able to publicly demonstrate their love and commitment to each other, something many of us had long taken for granted. Sadly, Dale succumbed to his battle with cancer a mere 15 months after that remarkable day – and neither family nor group of friends has been the same since. Now, with the parting of John, we will all grieve anew. “When you put family first, everything else falls into place” was a motto that both John and Dale lived by. John once told a friend, on being asked what his favorite sound was, that it was “the laughter of children”. Although not ‘technically’ a father, he loved his nieces, nephews, and grand/great-grand nieces and nephews as if they were his own children/grandchildren – and received that same admiration from them in return. He was adamant about supporting and maintaining (often hosting) special family traditions, including Pumpkin Carving Day, Cookie Baking Day, and elaborate, themed Christmas Eve celebrations. 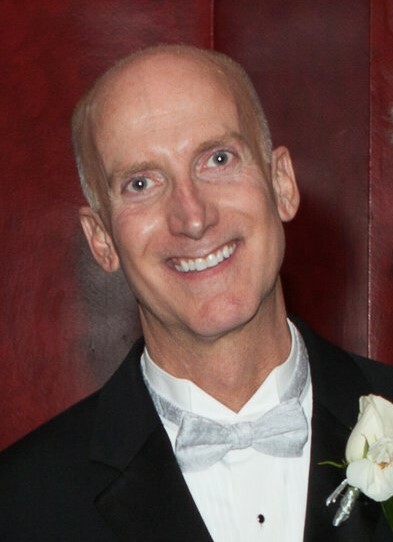 John was a 35-year employee of Republic, Northwest and Delta Airlines as a flight attendant, building up his wealth of treasured, lifelong friends with each move. John was a vibrant spirit in the midst of a sometimes gloomy world – he helped the world be a better place. He always saw the best in people and situations, and lifted up those around him. Some of the many comments his friends posted about him include statements like: You lit us all with your humor and love; John drew good people to him through his kindness, humor, intelligence and positive attitude; John was everyone’s best friend, he was one of the finest people I’ve ever had the privilege to call friend; he always listened, he made all of us laugh, encouraged us to live our dreams, stood by each of us through challenging times and shared some of our sweetest moments in life. John was a lover of anything Irish, especially Malahide Castle; traveling - particularly Paris, New York City, Martha’s Vineyard, and The Black Hills; his beloved black lab Maggy; Prince; cycling; Polo Ralph Lauren; and Tiffany & Co. He never did anything half-heartedly, and was one of the classiest guys most of us have ever known. He was humble and oh so lovable. John is survived by his brothers, Michael and Scott (Karen) Rynerson; his sister, Christine Rynerson, and numerous nieces, nephews and extended family. Visitation on Sunday, March 31 from 2:00 – 4:00 pm at David Lee Funeral Home, 1220 Wayzata Blvd E, Wayzata. Funeral service Monday, April 1 at 11 a.m., St. Mark’s Episcopal Cathedral, 519 Oak Grove St, Mpls with visitation one hour prior to the service. Memorials preferred to American Cancer Society or American Red Cross. Private Interment at the Clark Center Lutheran Church Cemetery in Clark, SD at a later date.